Today I happened upon one of the coolest displays of automotive history I’ve ever seen: An absolutely tiny Trabant museum sitting on the second floor of a vehicle inspection shop near Prague in the Czech Republic. Here’s a look inside the amazing little gem. Last week I drove from Germany to the Czech Republic to visit the beautiful city of Prague with my mom. 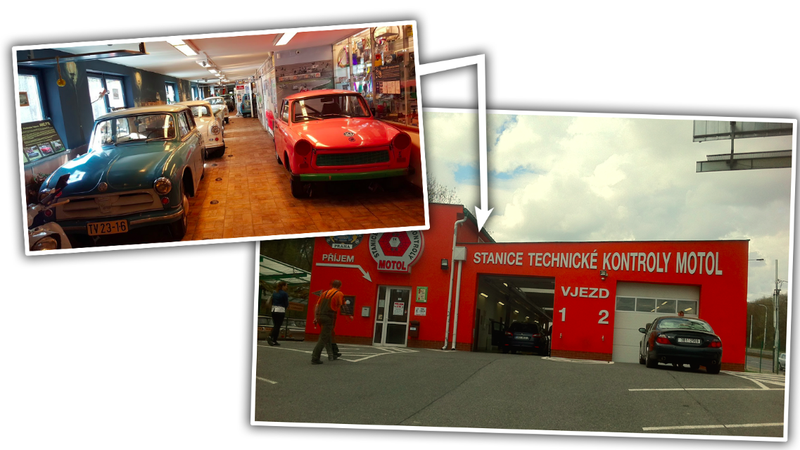 On the way, I spotted a sign for a Trabant museum, and immediately brought my mom’s car to a screeching halt. There was no way we weren’t going to check this out. But when I followed the sign’s directions, all I saw was the inspection garage you see in the photo above with a little “Trabant Muzeum Motol” logo with an arrow pointing to the left. “There must be another building around the corner,” I figured. I figured wrong. Going around the corner, I came across a giant “Trabant Muzeum” sign, and a big Trabi grafted onto the side of the inspection shop. How the heck there could be a Trabi museum in this little shop was a bit of a mystery to me. Immediately upon entering, my mom and I brushed our feet on the awesome Trabant floor-mat, bought some tickets at the counter, and were given a guide book. That book included a ridiculously-thorough history of the Trabant, as well as instructions around the museum. Those instructions basically entailed: go up the steps. That’s about it. That’s because pretty much the whole museum is on a single floor just above the inspection shop. But don’t for a second think that means this isn’t an amazing and thorough Trabant museum. Because it totally is. The walls in the stairwell are covered in Trabant wallpaper, with P50s and the letter S abounding (the “S” standing for the company that built the little “duroplast”-bodiedeconoboxes from the 1960s until the 1990s, Sachsenring). At the top of the stairwell is an awesome mural of the assembly line, as well as a case filled with Trabant toys. My favorite anecdote in the guidebook dealt with this AWZ P70 Zwickau shown below, the predecessor to the Trabant. Apparently a former owner of this one installed the rear trunk lid himself, because originally, one could only access things in the back through the front doors by folding down the rear seat. That’s kind of bonkers if you think about it. There was even this little cut-down Trabant with a television in front of it to allow you to imagine that you’re driving the 26 horsepower Eastern European wonder. And on the other side of the room from the garage scene, there’s more. Lots more, somehow. Then there’s this gorgeous Trabant 1.1—the last of the Trabi models—built only in 1990 and 1991. This place is just a gem. A tiny, but surprisingly impressive gem tucked into the second floor of a shop. How the cars got up there, I have no clue. But I’m glad they did. This quick little one-minute Instagram video pretty much covers the entire Trabant Museum Motol, but you really need to go there to read all the ads, get a close look at the cars and pictures and learn the history of this amazing machine to truly appreciate what these folks have done with such a tiny space. So the next time you’re near Prague, don’t drive past that little red inspection station. Check out the Trabant Muzeum Motol built into its second floor. It’s a tiny display filled with tiny East German cars and a whole bunch of tiny versions of those tiny cars. What more could you possible ask for?